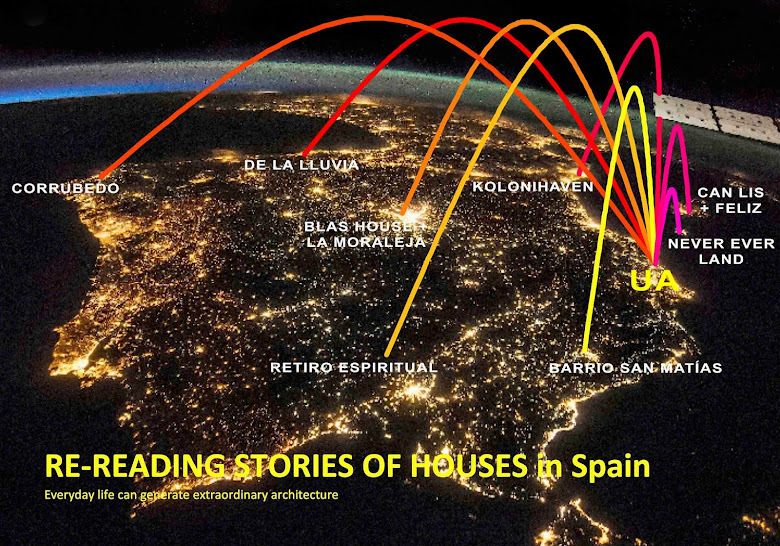 The chosen houses are the Blas House in New Sevilla (Madrid), the Houses in San Matias' Neighbourhood(Granada) and the House in Corrubedo (Galicia). For me these houses represent a very different type of architecture in the way they interact with their environment and itself in the way they are conceived. THE BLAS’ HOUSE Blas House in Sevilla la Nueva (Madrid) from Alberto Campo Baeza; as an idyllic fortress in a breathtaking landscape which, although has a weak relation with nature, which is mainly treated as tarjet of contemplation. THE HOUSES IN SAN MATIAS’ NEIGHBOURHOOD (Granada) from Juan Domingo Santos; as an example of pragmatic architecture, born from the needs of the inhabitants and favoured by neighbour’s agreement for the common benefit. THE HOUSE IN CORRUBEDO (Galicia) from David Chipperfield; as an act of rebellion, built against its surroundings, inside out the native tradition in order to face the potential qualities of the landscape. However these houses have a common point, there were conceived as homes, for different people, with different feelings and ways to live and understand the daily life. The video shows, from my own experience what should define a Home, over the differences of architecture and its possibilities. Apart from the idyll or the functionality. Proyecto 4 - Anna M.